CGA’s annual DIRT report provides a summary and analysis of the events submitted into CGA’s Damage Information Reporting Tool (DIRT) for the year 2017. The complete report is available for download below. In addition, we are providing access to aninteractive dashboardthat allows users to filter the data more granularly by factors contributing to damages. 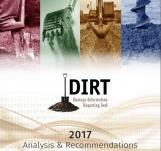 Visit DIRT Report for 2017 Interactive Analysis to review the dashboard.